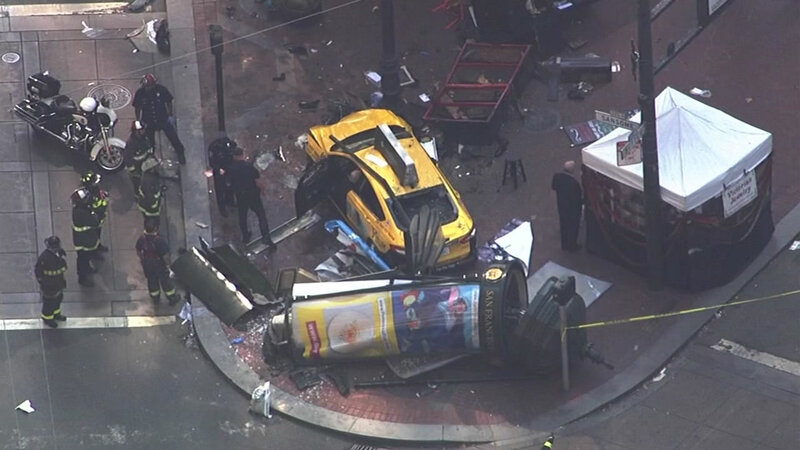 SAN FRANCISCO -- A taxi driver who injured two pedestrians when he crashed into a bathroom, newsstand and shoeshine stand in San Francisco's Financial District on Tuesday afternoon may have suffered a medical issue just prior to the crash, police said. Three men, including the driver, were injured in the 3:15 p.m. crash at Sutter and Market streets, where the taxi accelerated and drove up on to the sidewalk. Police today said the 59-year-old driver may have suffered a medical issue before he hit the gas, but the cause of the collision remains under investigation. The driver has been discharged from the hospital as of this morning, according to San Francisco General Hospital spokesman Brent Andrew. A 66-year-old man hit by the taxi is in fair condition and a 40-year-man remains in critical condition.